Over 9000 sq ft of living situated on 6 acres in Central York Schools and features cherry hdwd floors, custom cherry, maple cabinetry, cherry interior doors & trims throughout! 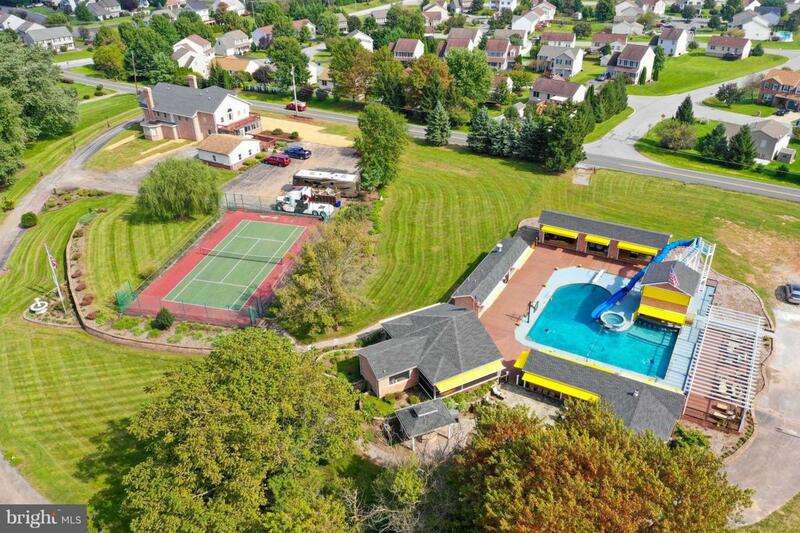 This home features a full size fenced in tennis court, gorgeous pool & beautiful Gazebo. This home offers 6 BR's each w/an en-suite bath. Spacious Kitchen with custom cherry cabinetry, Viking appliances, granite counter tops, large center island and large walk-in pantry. Spacious 1st floor Master Suite with separate sitting area and private bath with his & her vanities with granite counter tops, custom vessel sinks and pendant lighting, corner jetted tub and large walk in shower. The large walk-in master closet offers custom cherry cabinetry and built-ins. Separate 2 story Dining Room with floor to ceiling windows, Formal Living Room and Sitting Rooms. The 2nd floor features four additional bedrooms, Family Room with custom built-ins and two interior balcony overlooking the 1st floor. The finished lower level features a Family Room with built-in wet/dry bar, Exercise Room with mirrored walls, Craft Room, private Office and storage room with double doors leading out to the rear driveway. Beautiful in-ground pool with tube slide, gas heater, separate Jacuzzi and a swim up bar with eight under water bar stools, a motorized lift door and a 12 x 10 walk in cooler. Enjoy outdoor dining in the screened in outdoor Kitchen with hot and cold buffet bar, fully equipped kitchen and two large roll-up doors with screens. Gather around the outside 26 x 10 bar with granite counter tops, seating and five motorized lift doors. Separate pool side men's and ladies changing/bathrooms. The 53 X 12 pool lounge includes tiger wood ceiling and three airplane hangar doors that open up to the pool. Large covered 60 x 40 slate patio with fire pit and a 40 x 20 covered slate patio with custom aluminum pool table and railings. Custom covered outdoor BBQ area with granite counter tops. Relax and unwind in the 10 x10 Sauna. Detached 80 x 40 eight car garage with workshop. O/S attached two car garage, large driveway with turn around area and additional parking. Detached 8 car garage w/workshop. Schedule your private tour today to explore all of the wonderful amenities this home has to offer. Incorporated City Name Manchester Twp.